Territory Families compiles a daily census showing the number of young people held at the youth detention centres in Darwin and Alice Springs. The graphs below summarise the weekly data, starting from 1 July 2017 until January 29, 2018. ABOVE: Average daily number of kids in detention – by location. Blue is Alice Springs, orange Darwin. The figures for Alice Springs in the most recent two weeks were the highest for the period, an average of 17.6 and 17.3 children, respectively. 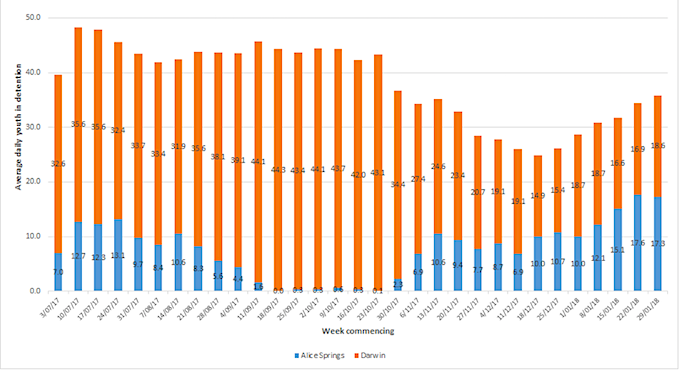 Alice Springs numbers are rising while Darwin’s are declining. 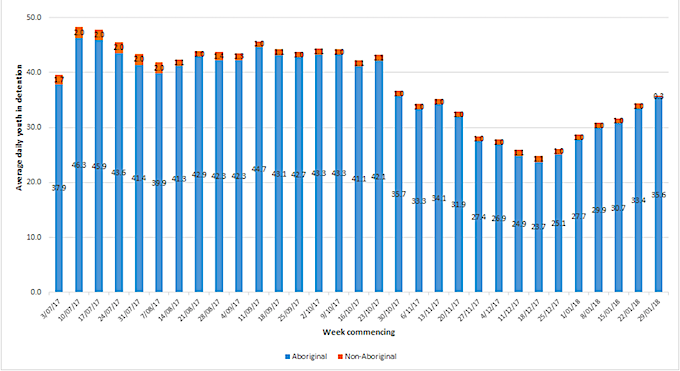 ABOVE: Aboriginal youth (blue) massively outnumber non-Aboriginal (orange). Darwin and Alice combined, in the survey’s latest week, there were an average of 0.3 non-Aboriginal youths in detention compared to 35.6 Aboriginal ones – 100 times more. In other graphs boys vastly outnumber girls. For example, in the week commencing January 29, 2018 the averages were 34.1 boys compared to 1.7 girls. A statistic that is not reported but that would be very pertinent is the proportion of children in the care of the Minister, Dale Wakefield. Could it be because so many of the offenders are raised in overtly racist households where they are taught from when infants that all things Indigenous are superior to all things mainstream? For the child, the first casualty of this would be schooling and a respect for the possibilities that schooling offers. And then when they get a bit older and come hard up against the unavoidable absurdity of what they have been taught, and realise that they are not only uneducated and ignorant but likely to remain uneducated and ignorant, anger and resentment give rise to a lashing out and a pathetic if understandable attempt to cry the victim? “You owe me.” No, lad or lass, we don’t owe you, but your parents and early childhood mentors surely do. The stats are not surprising. Interestingly on an Australia wide note (as well), people complain that there are more Aboriginals (ratio) than non-Aboriginal people in custody. But nobody seems to be able to work out why. Perhaps it is because there are more convictions of Aboriginals? Note there is no mention of offences, only convictions. Perhaps Ms Wakefield needs to wake up and do something measurable to address this in the Territory? Perhaps also, the taxpayer funded NGOs should be contributing 100 times more financially. It’s really all taxpayer money anyway, but a token gesture would go a long way to acknowledging they are at least taking this massive issue seriously.